Accel 140024 Super Coil Ignition Coil For 96-01 GM Vortec Engine 5.0/5.7/7.4L Product Details. Country Of Origin: United States. This ACCEL GM HEI remote mount ignition coil is compatible with late model computer controlled remote mount HEI systems. Engineered with optimized low resistance, high turns ratio windings around an M36 high silicone magnetic steel E-core for higher energy and voltage outputs. Results in quicker starts, improved idle quality, crisper throttle response and more high RPM power. Compatible with late model GM computer controlled remote mount HEI systems. Can also work with CD ignition systems. Special high temperature epoxy resists shock and vibration, while increasing thermal conductivity. Brass coil wire contact increases energy transfer and resists corrosion better than aluminum. Comes complete with new mounting hardware. 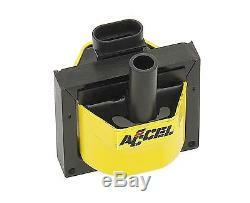 High dielectric strength ACCEL Yellow over molded housing. Output is 48,000 volts with 0.2 ohms resistance. Direct Plug In Replacement Direct OE Fit. Highly Specialized Silicone Magnetic Steel Cores. Standard Motor Products SMP Dr-49. Specification: Color: Yellow Maximum Voltage: 48,000 volts Peak Increase in Energy vs. It all depends on where our products are when you place your order. The final charges appear at checkout. Important things to keep in mind. We also can't deliver to APO or FPO addresses. After you've completed checkout, you can review these charges on the Order details page. WUnderCarParts wants every customer to be completely satisfied with their order. For most items we carry, we offer a 30 day return period. We want to know why you're returning the product, and if there's a mistake on our part, we'll do the necessary correction to guarantee your satisfaction. We're always willing to work with you to provide a fair and speedy resolution to any issue. WUnderCarParts is one of the top emerging online retailers of automotive parts and accessories in our day. With over 10 years of experience in the automotive replacement and aftermarket parts industry, we strive to bring you the highest quality products from the most trusted brands, all at the lowest prices guaranteed. Whether you are a dealer, end-user, off-roader, racer, hauler, or daily driver, wUnderCarParts has the parts you need at the prices you want. We are a Detroit, Michigan based company, birthplace of quality American Auto. Our mission is to have a company that provides the very best product in our industry and elevates the auto parts online purchasing experience in the eyes of the general public. Our mission is to offer you the lowest possible pricing on every product we endorse and to always attempt to deliver them to you free of charge and in a timely manner. Our mission is to provide an environment in which you will grow, prosper, enjoy, and fulfill your potential in order to accomplish our missions to our shoppers and visitors. The item "Accel 140024 Super Coil Ignition Coil For 96-01 GM Vortec Engine 5.0/5.7/7.4L" is in sale since Tuesday, August 30, 2016. This item is in the category "eBay Motors\Parts & Accessories\Car & Truck Parts\Ignition Systems\Coils, Modules & Pick-Ups".